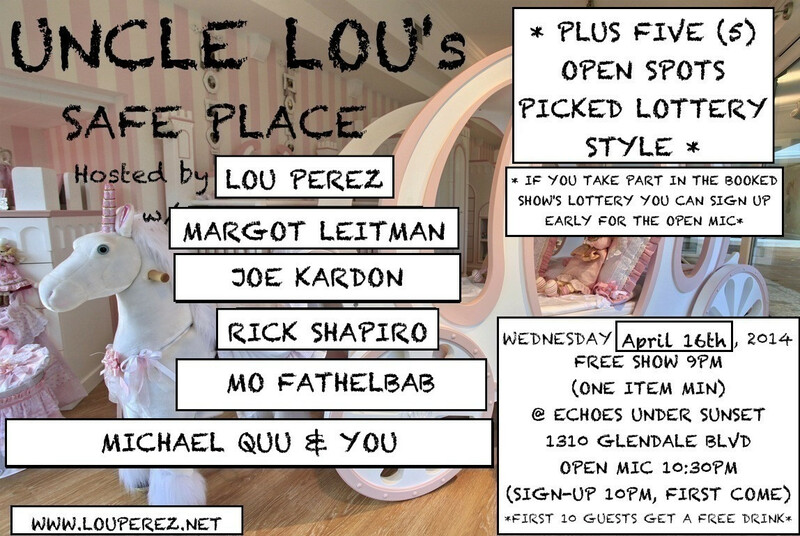 4/16 Uncle Lou’s Safe Place! This post is filed under Shows. And it's tagged with joe kardon, Live, lou perez, margot leitman, michael quu, mo fathelbab, rick shapiro, Stand-up, stand-up comedy. If you’re around tonight, Friday April 15th @ 8:00pm, our very own Lou Perez will be doing stand-up comedy at Billy Keenly’s and John Milhiser’s show, Stampede: Free Range Comedy. This post is filed under Shows. And it's tagged with Billy Keenly, John Milhiser, lou perez, Stampede, stand-up comedy, THe Peoples Improv Theater, The PIT.